Geoffrey has lived in Ripon since 1968 aged 21 after he finished his teacher training at St John’s College, York. He taught in primary schools for 26 years full time and then for a further 10 years as a supply teacher. Geoffrey has been involved in a number of clubs and societies over the years, some being in sport. A lot of his spare time has been taken up in sports coaching and youth club activities with young people. He is the Captain of the Bellringers at Ripon Cathedral – a post held for 34 years. After studying full time to gain a teaching qualification, Geoffrey obtained further higher education certificates with part time study. These were a BA degree with the Open University and an advanced diploma with Leeds University. The opportunity to join the team of Municipal Officers at Ripon City Council came in November 2004 when he was appointed deputy to the Serjeant-at-Mace, Jim Vauvert. Early in 2005 the post of Mayor’s Serjeant was introduced and Jim Vauvert continued as Mace-Bearer with full civic ceremonial duties. Geoffrey’s duties as the Mayor’s Serjeant include taking the Mayor and Mayoress to invited functions and introducing them to the hosts. He is also responsible for the chains of office which have to be returned to the Town Hall once the function is completed. Ripon has had a Mayor since 1604 and the present chains were brought into use much later. The Mayor’s in 1859 and the Mayoress’s in 1896. Some Mayors have preferred to use their own cars but in recent years Mayors have used the Mayor’s Serjeant as a driver and used his own car. Ripon does not have an official Mayoral car. As well as looking after the Mayor and Mayoress Geoffrey is one of the municipal officers who give talks to visiting parties about the Ripon Insignia. The uniform that is worn by the Mayor’s Serjeant is a black suit with the Seal of Ripon tie which has a round motif with the Ripon horn and the date 886AD, reputed to be the date of Ripon’s first Charter. 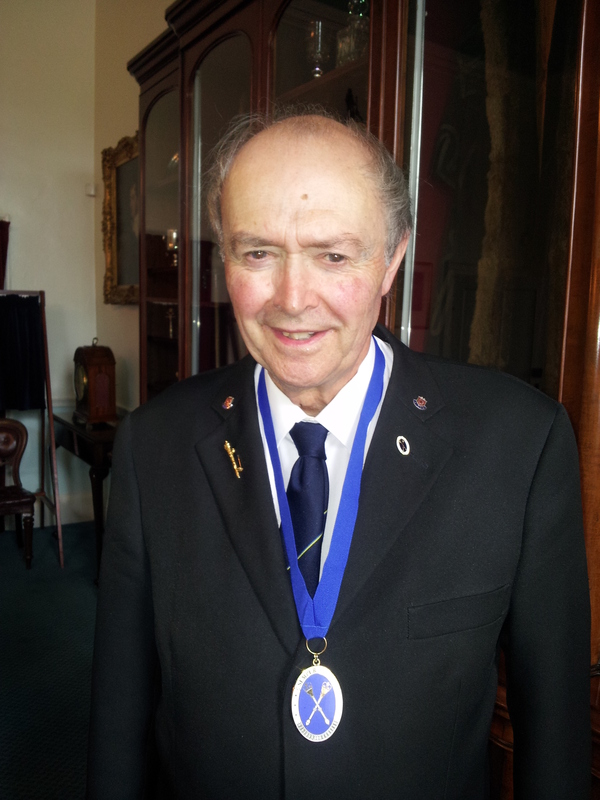 When giving talks on the Insignia, Geoffrey wears the Guild of Mace-Bearers badge and ribbon. Other duties undertaken by Geoffrey are Deputy Mace-Bearer, Bellman, and Stave-Bearer in civic processions. When ringing the bell and stave-bearing he wears a beige coat and tricorn hat similar to the Hornblower’s.